An exhibition of more than 30 canvases and 12 plastics by Bulgarian artists was opened at Istanbul University on 19th of March. The exhibition is part of the cultural programme within the Bulgarian presidency of the Black Sea Economic Cooperation Organisation. The Bulgarian artists present Bulgaria as they remember and love it. Bulgaria, which has helped them develop their talent. Here we can also see the beauty and traditions, as well as important topics such as those about the faith in Bulgaria and man. Vezhdi Rashidov, Chair of the Committee on Culture and Media at the Bulgarian Parliament: All these people have graduated from the Bulgarian Academy of Arts, wonderful authors. This brings together many artists of Turkey as well, the idea is to go to Sofia and to show what good artists work and live in Turkey, created in Bulgaria. 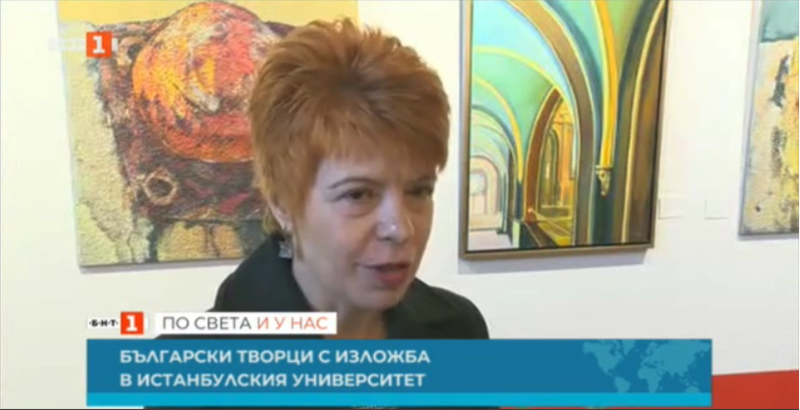 Pavlina Kopano, curator of the exhibition and artist: Many authors who in some way are connected with Bulgaria. Their works, their paintings, their sculptures show the colour of our country, the wisdom of our people, the individuality of each representative of the Bulgarian art. The glance to Bulgaria has also shown something very important, namely, what unites us - culture, friendship and diplomacy. Earlier today, the chair of Parliament’s Committee on Culture and the Media, Vezhdi Rashidov, met with the Rector of Istanbul University. The meeting was attended by the Rector of Sofia University Prof. Anastas Gerdzhikov, who discussed possibilities for cooperation - one of them is the study of the Islamic archives, which are located in Bulgaria.